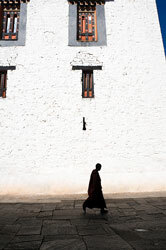 A monk walks along a path from the bottom of a mountain to a shrine at the top. He leaves at eight in the morning and arrives at six in the evening, walking at an irregular rate, pausing and resuming whenever he likes. The next day he walks back down the same path, starting again at eight, arriving at the bottom at six, and walking likewise irregularly. Prove that, somewhere along the path, the monk was there at exactly the same time on both days.